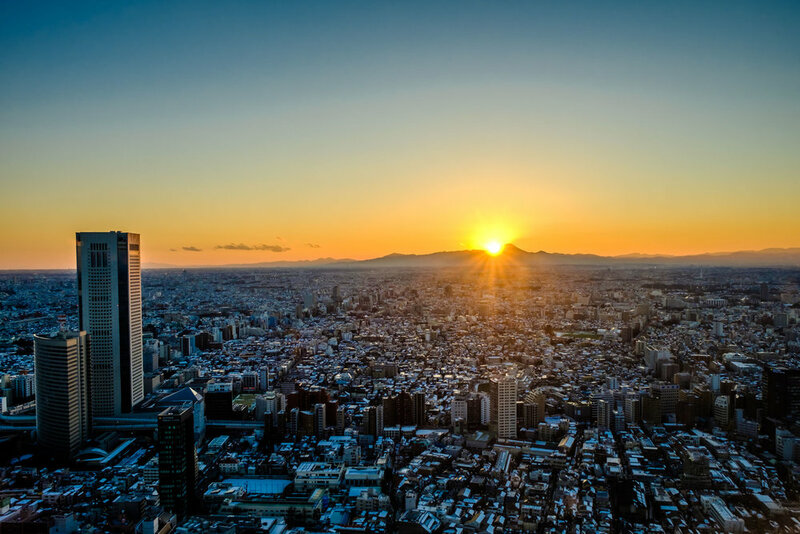 The Tokyo Metropolitan Government Building in Shinjuku, has the best FREE observatories in the city and should be on the must visit list of every visitor. See it here! Currently, the South Tower is closed for renovations until spring 2019. One of my favourite observatories in Tokyo is the Tokyo Metropolitan Government Building. It mightn't be as high as Tokyo Tower or Tokyo Skytree, but like them it has some great views of the city. Tocho (as it is commonly known) was completed in 1991 and at 243 meters in height, it is one of Tokyo's iconic buildings. It is conveniently located in Shinjuku, and looks like a gigantic computer chip or a Gothic cathedral (so some people say). The views from it are great and the best thing about it, is that it is FREE. 11. so many other famous skyscrapers in the city I won't even try to name them at all! The north tower has far less of interest, so I only go to it at night, as it is usually open until 11 pm (for some weird reason the south tower usually closes at 5:30 pm). Just be aware that while you can get a great view of Mount Fuji, like the south tower, you'll mostly be getting shots of the western part of the city, which is mostly residential. One really bad thing about the observation decks, but most understandable, is that tripods aren't allowed. However, there are ledges along the windows which you can use. You just need to be careful of people dropping their bags right next to your camera though! The Tokyo Metropolitan Government Building is a fantastic place for photographers and I highly recommend it. Just check out the images here or on the net and I hope you'll agree. You can see its the building's website here. The Tokyo Metropolitan Government Building is located in Nishi-Shinjuku, about a 10 minute walk from Shinjuku station, which is one of the major train stations in Tokyo. Shinjuku has so many train lines going through it so I doubt anyone will have a problem getting there. Both of the observatories open at 9:30 am. However, the north observation deck closes at 11:00pm (last entry is 10:30pm), while the south observation deck closes at 5:30pm (but is open until 11pm when the North Observation deck is closed). The south observatory is closed the first and third Tuesday of every month and the north observatory is closed on the second and fourth Monday of every month. If one those days listed above falls on a holiday, the observatory will be open but closed the following day. The observatories are closed over the New Year’s holiday season (29-31 December and 2-3 January). However they are open on January 1. Tokyo-Edo Museum - learn a lot about Tokyo's past, and get some great photos too! Tower Hall Funabori - another of Tokyo's free observatories, but this one is really small!